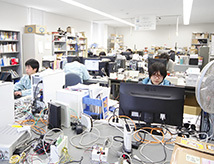 Details of our business｜Measurement system for disaster prevention｜OSASI Technos Inc. In addition to monitoring at individual hazard locations, we provide information systems for monitoring over a wide area utilizing the company’s cloud monitoring service, thereby contributing to the government disaster prevention infrastructure. Groundwater level meters, extensometers (landslide meters), strain gauges, etc. We provide a suite of quality and reliable products capable of long term stable operation in mountainous and remote areas where there is no electrical power supply, and that are resistant to environmental factors such as surges, temperature, humidity, etc., as well as remote monitoring systems for convenience. With the energy-efficient design resulting from constant research, the company’s measuring instruments can realize long term operation with only commercially available batteries, and continue to reliably record measurement data even under severe outdoor environments. 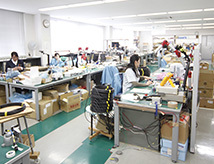 In order to provide consistent and uncompromising quality, the company’s measuring instruments are all designed, manufactured, and shipped from our factories in Japan. We have sound technical capability to flexibly respond to special requirements. The design and development department carries out research, development, and design of new products, as well as product improvements. At OSASI Technos, development of all the hardware, software, and Windows software incorporated into our products is carried out in-house. We are working to further improve our products in response to the various demands of our clients, in order to gain their high trust. In the manufacturing department, the emphasis is on quality, and in all processes strict quality management is implemented. By introducing various testing equipment such as image inspection equipment, automatic pressure testing equipment, etc., a comprehensive testing and inspection system has been constructed for all production processes. OSASI Technos provides a service to enable graphs and data from the measuring equipment on site to be viewed and data to be downloaded via the Internet. We provide a wide range of services from periodic measurement work to remote monitoring of emergency or disaster sites. * For Japan only. We are developing this service for overseas.